By the first of April we were itching to get the RV and boys out for a longer trip. 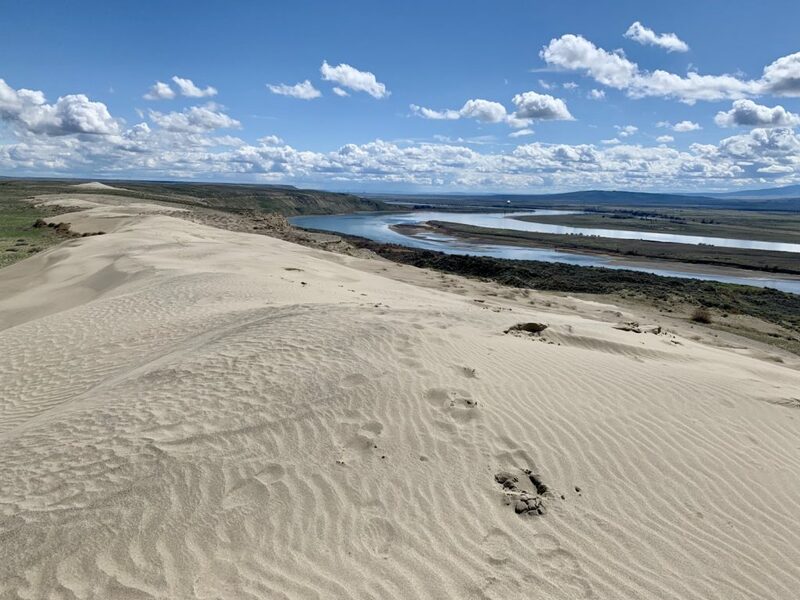 Despite continued above normal precipitation and below normal temperatures, we departed on a two week adventure starting with a week in Yakima followed by a week in The Columbia River Gorge. 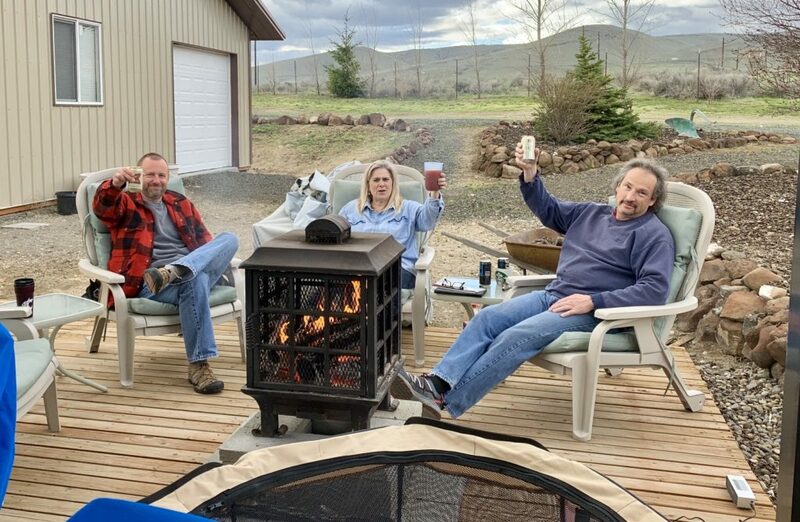 While in Yakima, we were fortunate enough to base-camp on my cousin’s property. Jerry and Shantel let us hook up to their water and electricity (a first for us) and spoiled us with great food and company. Each weekday, they went off to work while we explored the area. The weather was not as nice as predicted and we had a lot of wet, windy, and dreary conditions. But we did manage to find a few sun breaks here and there and had a nice week despite the weather. For the weekend, we enjoyed family time with Jerry, Shantel, and Shantel’s parents Dan and Vicki. The boys continued to adapt to their new surroundings. 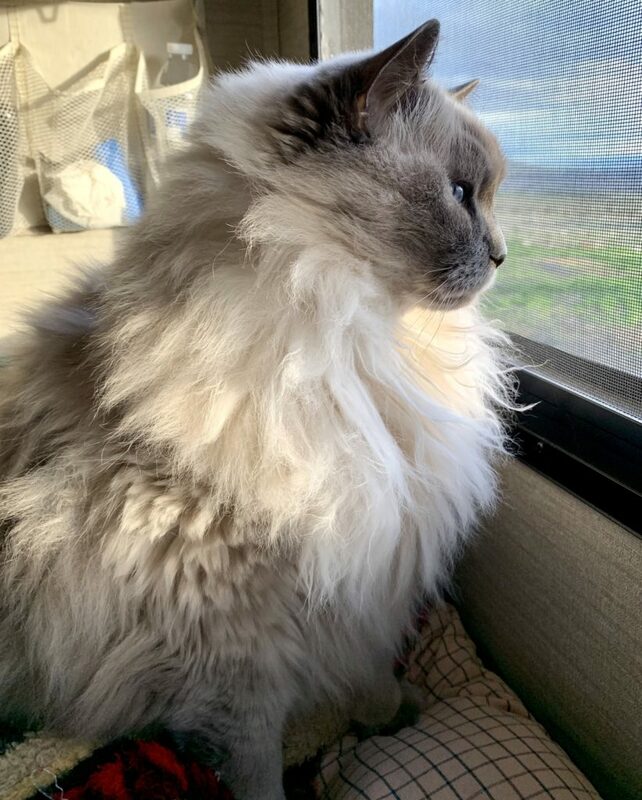 Indy loved all the bird and bunny watching and even enjoyed watching my cousin’s dogs (they are very well behaved). Jake…well, Jake is getting to be a bit of a moody old man. While I can’t say he is enjoying being an adventure cat, he seems to be adjusting as well as I could hope. 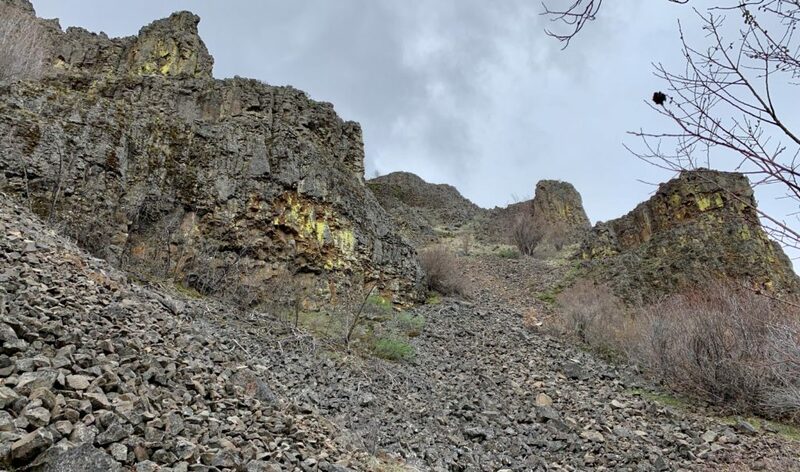 Ginkgo Petrified Forest State Park is a 7,124-acre park in Central Washington along the Columbia River. The forest is also a registered National Natural Landmark. 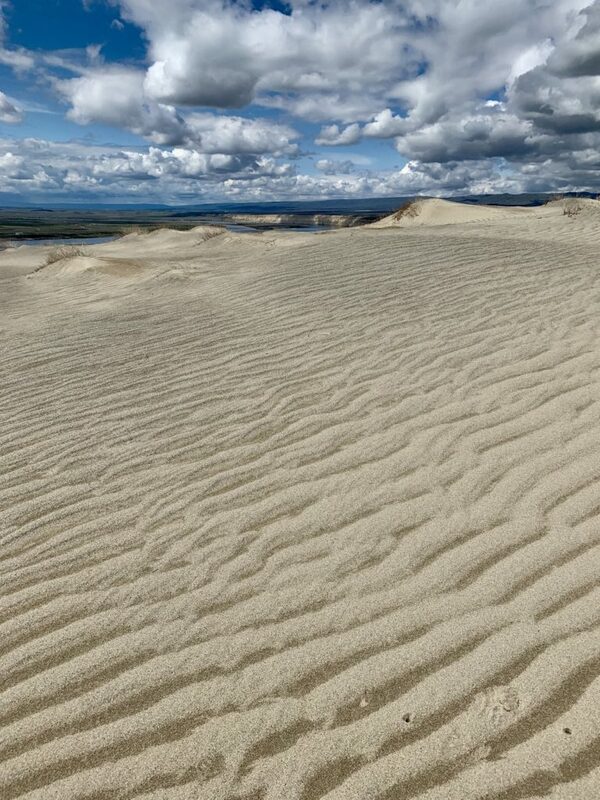 According to the park brochure, this area is home to one of the most diverse petrified forests in North America. 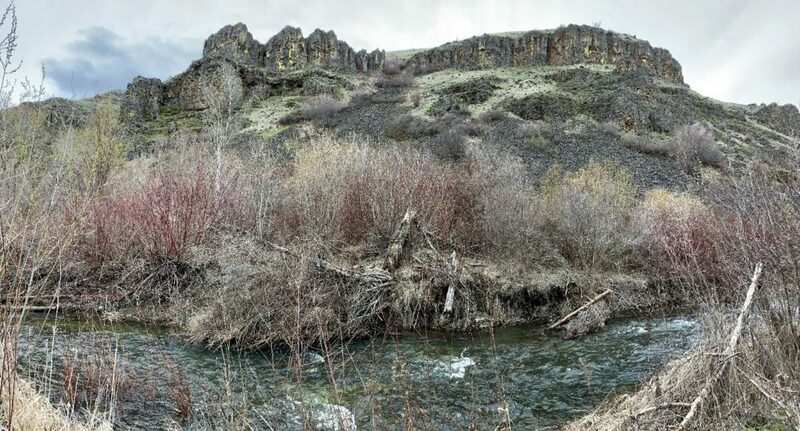 The petrified logs formed when the Ginkgo lava flow covered and entombed water saturated trees that had fallen into an ancient lake. Encased in basalt for over 15 millions years, minerals trapped in the water changed the wood into petrified logs. 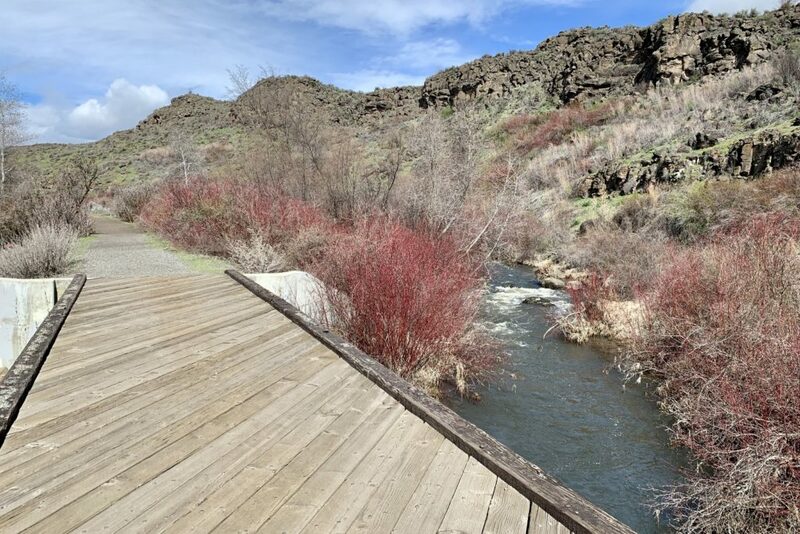 The park consists of two areas at the edge of the riverside town of Vantage, an interpretive center and nearby “trail side museum”. 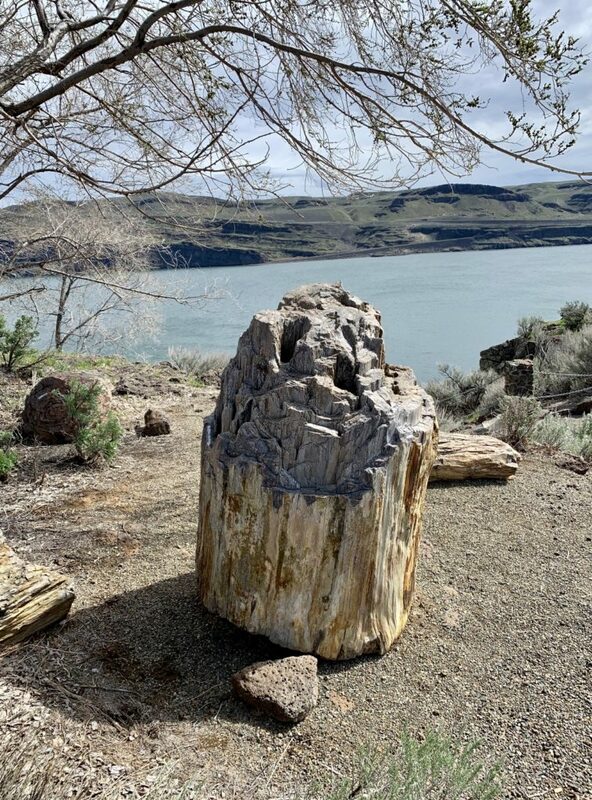 The interpretive center was closed, but we were able to view some nice pieces of petrified wood and enjoy sweeping Columbia River views. 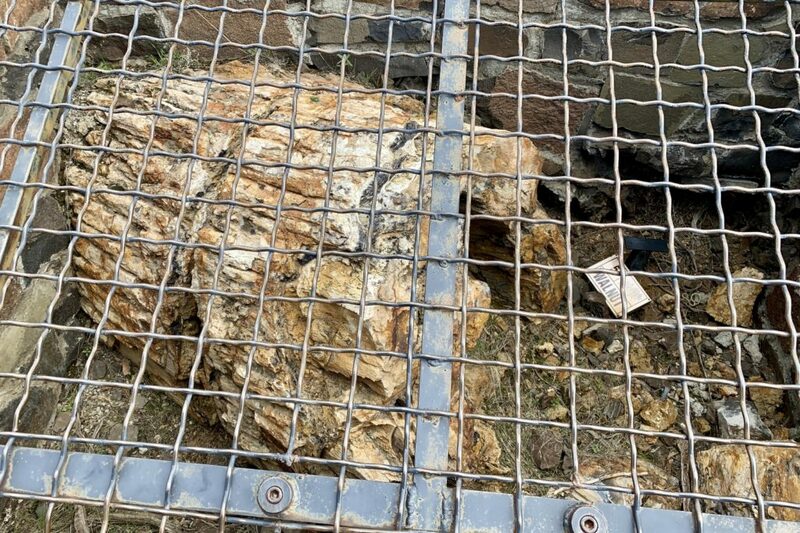 The trail side museum, constructed by the Civilian Conservation Corps in the 1930s, consists of an interpretive trail that passes by some 20 species of petrified logs in their original settings. We were disappointed to find all the logs under a heavy metal grate. It is a shame such protections are necessary. 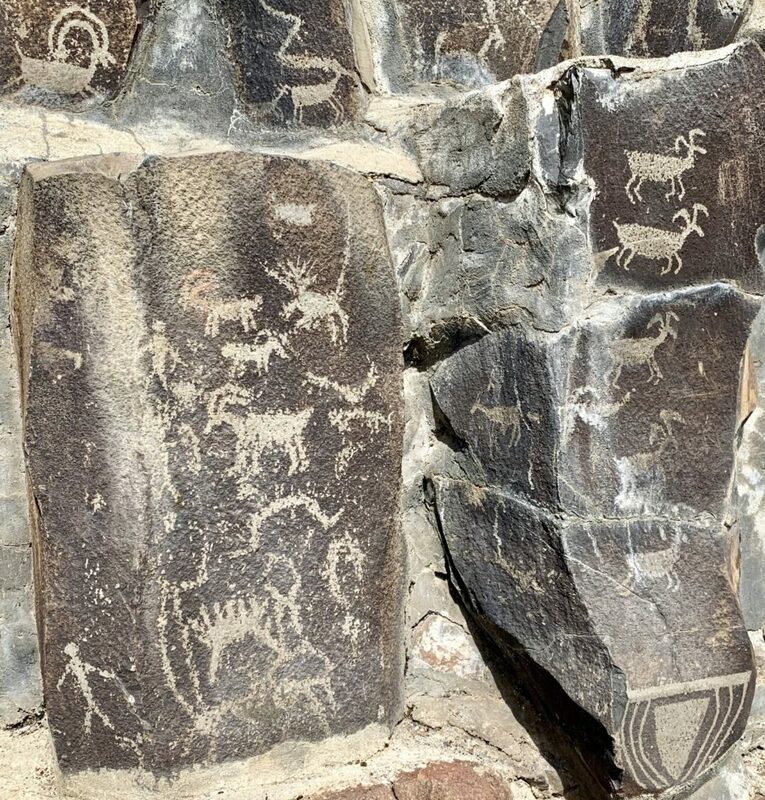 By far the highlight of Ginkgo was seeing the Vantage Petroglyphs behind the interpretive center. 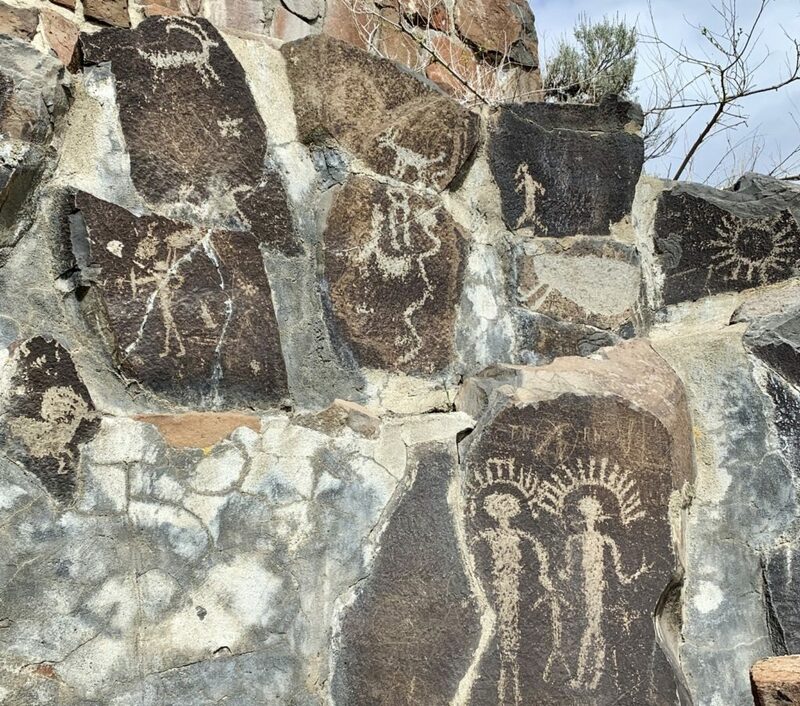 This rock art was originally located on basalt columns about a mile to the north. 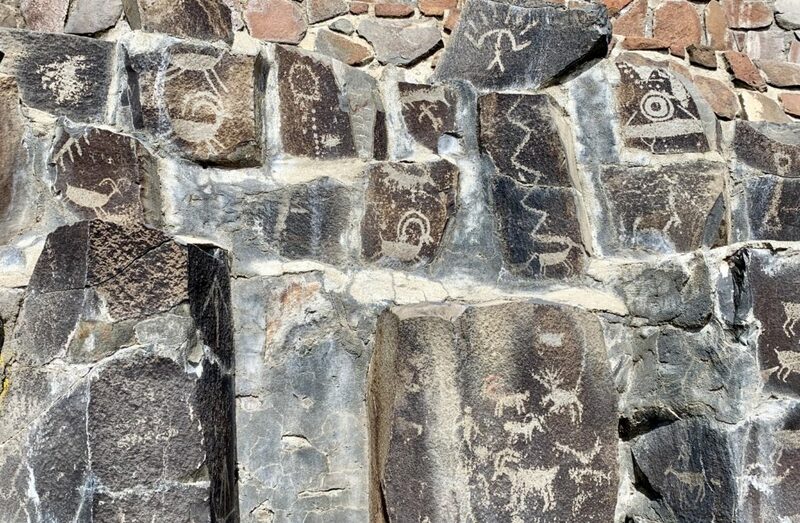 Once numbering over 300 figures, the glyphs were moved to their current location prior to their native site being drowned by the rising waters behind Wanapum Dam in the early 1960s. 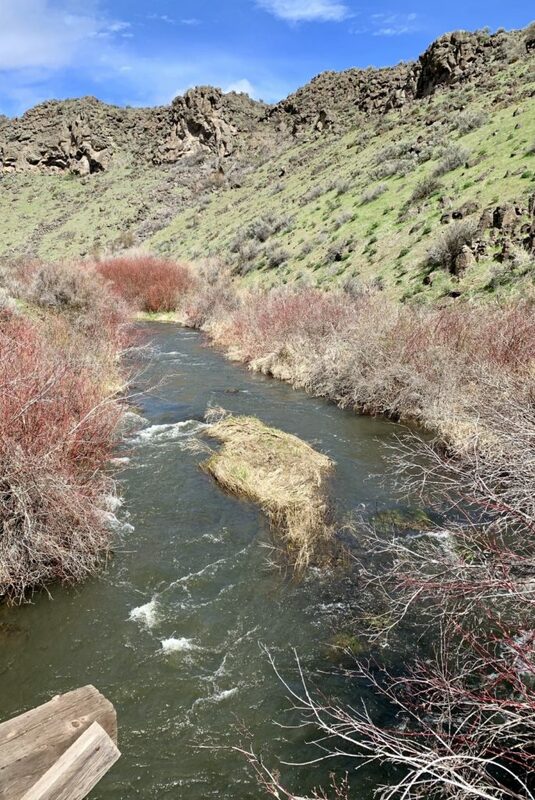 Umtanum Creek, a tributary of the Yakima River, had been on my bucket list after seeing photos of bighorn sheep thriving in the canyon. 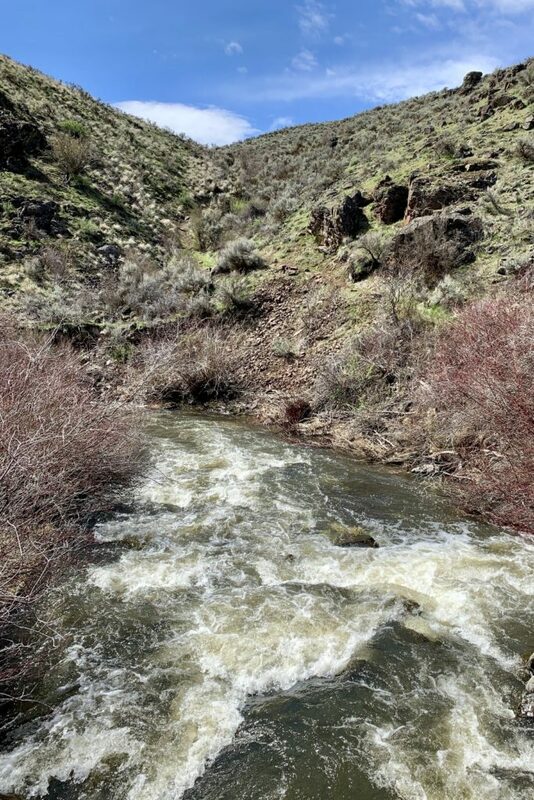 This was a pretty canyon hike with towering basalt formations and a charming little creek. After our late winter, the canyon was behind schedule for wildflowers and trees blooming, but it was still enjoyable. 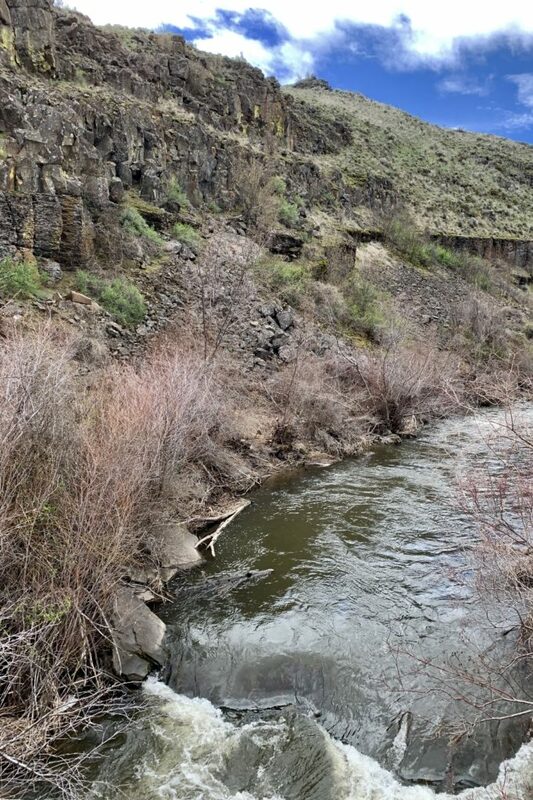 We didn’t see any bighorn up Umtanum, but we did see a small group along the Yakima River. 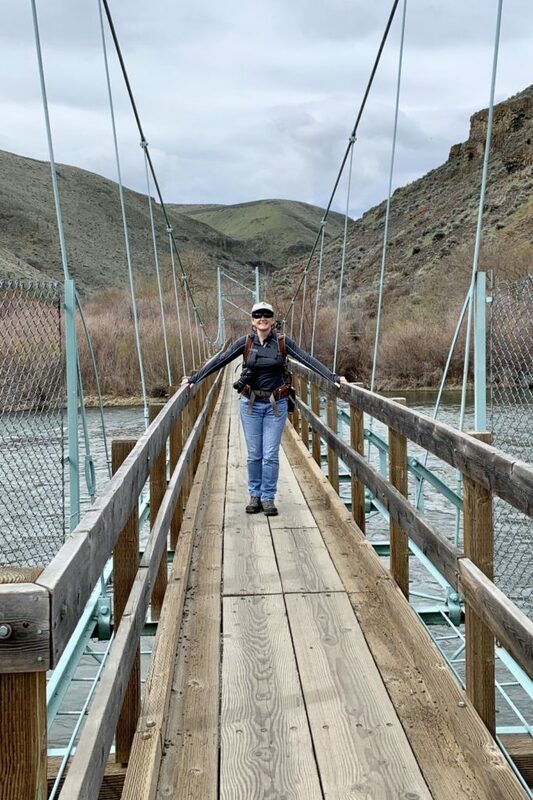 Highlights of the six mile hike included crossing an impressive suspension bridge, route finding along a rocky slope, and two creek crossings over downed logs. Our most interesting wildlife sighting was about half a dozen turkey vultures circling overhead…I wonder what they were trying to tell us? 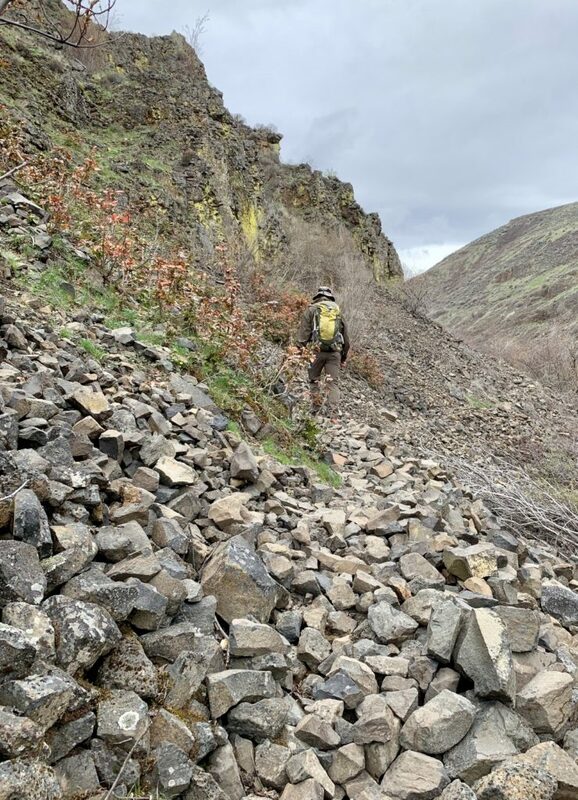 The Cowiche Canyon Trail follows an old railroad bed beneath basalt and andesite cliffs along beautiful Cowiche Creek (click here for map). We crossed Cowiche eight times (each direction) on well-maintained foot bridges. With virtually no elevation change and at only six miles roundtrip, this was an easy stroll. 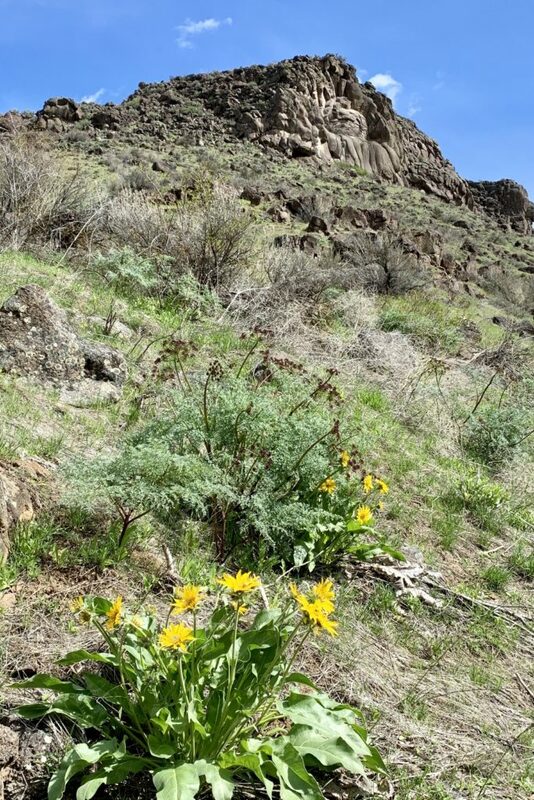 We saw our first balsamroot of the year and enjoyed some sun breaks, a rare sight during our week in Yakima. 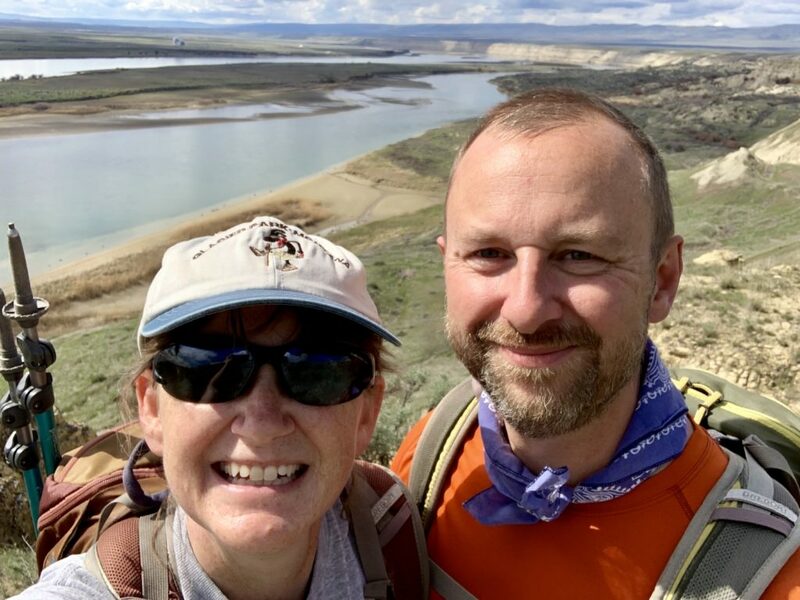 On Friday we made a return hike to the White Bluffs North area of Hanford Reach National Monument. I blogged about this hike in detail back in 2016. We enjoyed that visit so much we decided it was worth another trip. 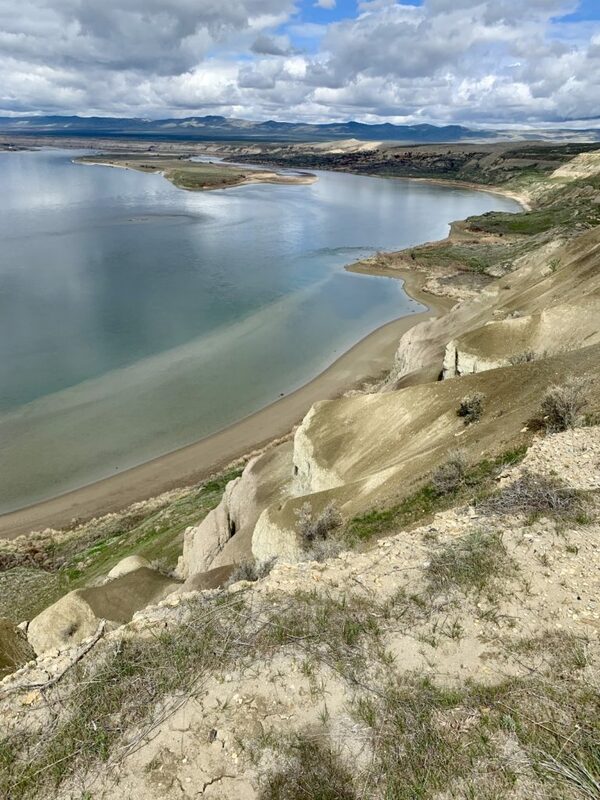 This six mile hike has a wide variety of natural and man-made wonders from towering cliffs and sand dunes to sweeping views of the Columbia River and desert wildflowers to some really eerie World War II and Cold War sites. 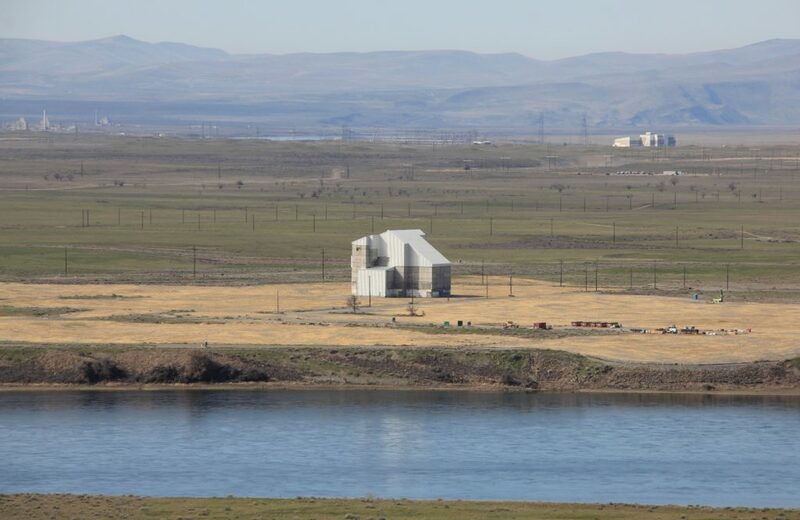 It is a bit strange to hike within sight of several old reactors which produced the majority of the plutonium found in the U.S. nuclear arsenal. 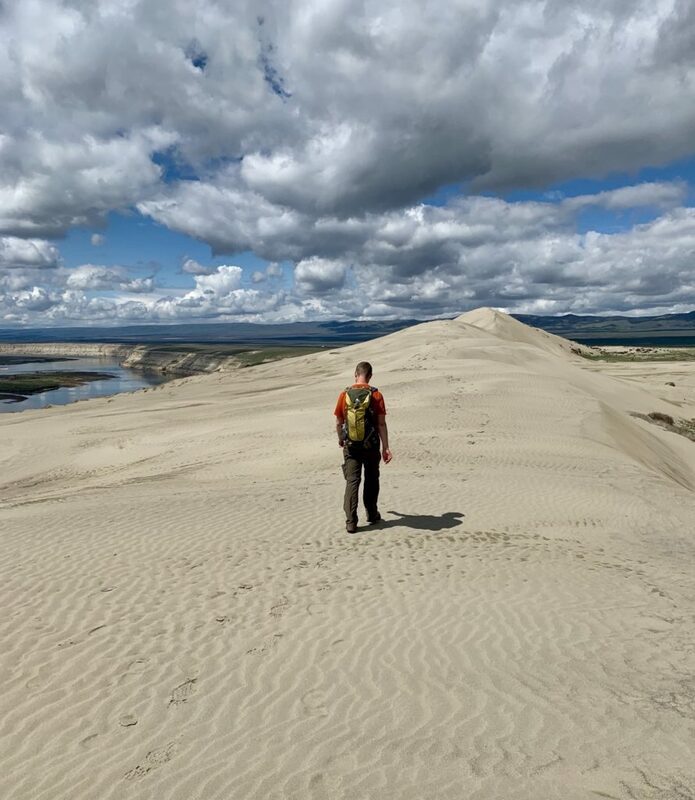 The highlights of this hike are climbing the pristine sand dunes and the views down to the Hanford Reach portion of the Columbia River. We were also treated to a pelican sighting—when a bird with a twelve foot wingspan flies in front of you, it grabs your attention! Water and electric hookups are sweet. We won’t have them very often, but we’ll love every second when we do. Yakima isn’t an exciting destination, but family made the week a perfect one. I never thought I’d reach for a cell phone camera before my “real camera”. Never. But I’ll admit my new iPhone XR takes a decent photo and I’m enjoying not always having a heavy camera around my arthritic neck. I carried my Canon DSLR all week, but used it very little and actually stowed it in my backpack a couple times. Without a doubt, the Canon is still the superior camera with the superior final product, but more and more my blog photos are coming straight from my phone. I enjoyed ALL the pictures! Especially of the petroglyphs! I love hearing how Jake and Indy are doing too. 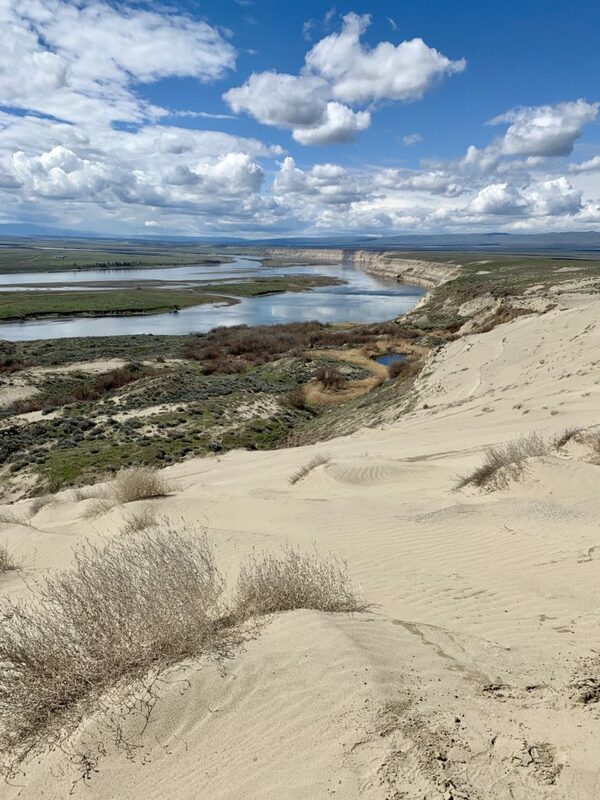 I really enjoyed the Hanford Reach area. Dave and I have fished up in the Reach and have caught some really nice Bass. Your new cell phone does take amazing pictures! I am with Laura in that I enjoy hearing how the boys are adapting to their new life style. 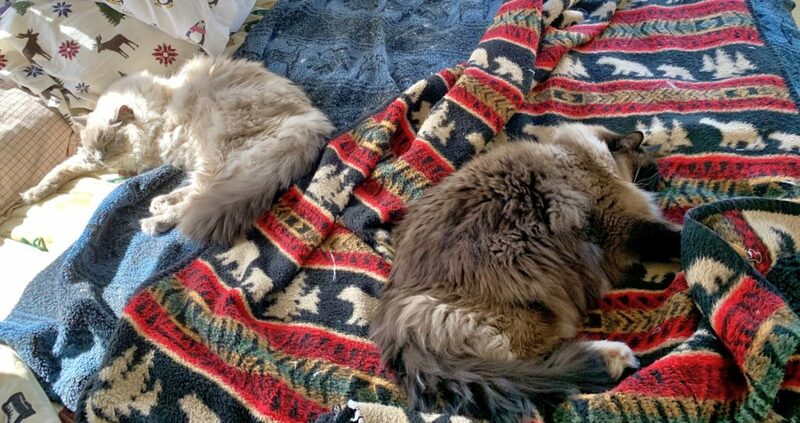 Grandma and Grandpa always had their cats travel with them and my brothers while out building homes around the Northwest. The cats insisted that they went with them. I will be anxious to see the Columbia River Gorge photos of the roaring waterfalls and gorgeous views of the mountains and fields of wildflowers. Unfortunately, most of the waterfalls are still closed due to the 2017 Eagle Creek fire. But we did see a really cool one near Beacon Rock yesterday. 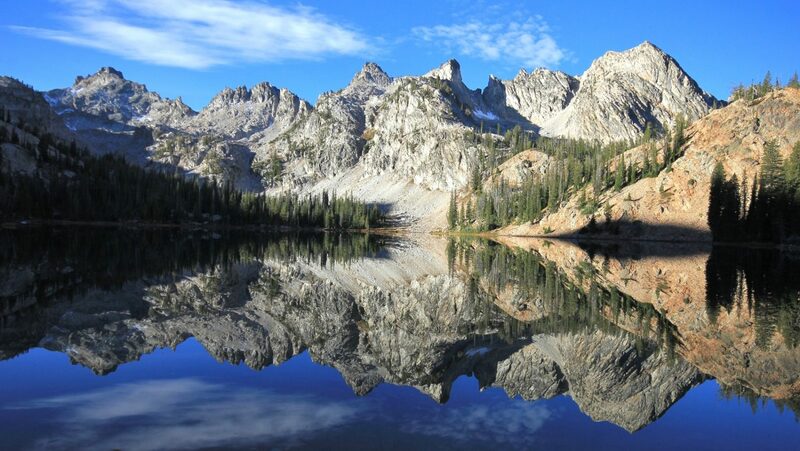 No matter how long we hike here, it seems we’ve only scratched the surface of what the area has to offer!